The University touts the Elliott School of International Affairs for its building near the International Monetary Fund, the World Bank, the White House and the State Department. But at the school’s celebration Friday, Dean Michael Brown urged students to appreciate not just its location but also the scholars and leaders that make it unique. Brown said positive global change, such as the average life expectancy increasing from 31 to 70 years old over the last hundred years and waves of democratization, happens – but not on its own. Brown told graduates that vision, character, courage and perseverance are the keys to progress. With more than 20,000 Elliott alumni working in about 100 countries, students should look forward to a career of visionary work, he said. Sanders said the Class of 2014 studied at the right time, with opportunities to study abroad during the Arab Spring and hear lectures by former Federal Reserve Chairman Ben Bernanke. 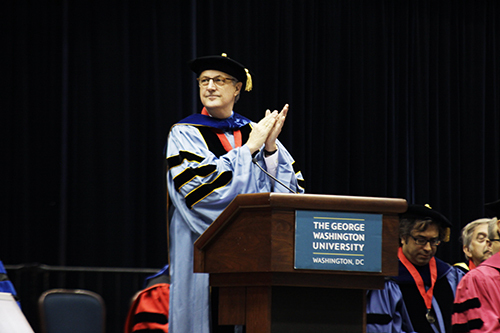 David Shambaugh, the director of the school’s China Policy Program, said international affairs degrees were just as useful today as they were in the 1970s when he earned a bachelor’s degree in East Asian studies from GW. Shambaugh said his Elliott classmates boasted careers ranging from global investment banking to think-tank analysis to intelligence. One of those classmates, a Chinese art historian, married him more than 30 years ago. Shambaugh said miscommunication and a “deficit of mutual trust” cause major wars today. He said graduates have the responsibility to engage and educate the “ignorant public” about different cultures. Shambaugh reflected on his own graduation ceremony speaker in 1977, who was the ambassador to Bangladesh.